The Diamond Crystal Salt company began in 1886. That's when John and Louis Alberger, together with Charles Moore and Horace Williams patented a new process for making salt in St. Clair, MI. This Alberger® salt process made it possible to create unique-shaped crystals with numerous facets. The result was an amazing salt with extraordinary adherence, blendability and flavor. In 1929, General Foods acquired the Diamond Crystal® brand, introducing several new forms of salt from 1946-1950. These included trace mineral salt, pellets and packets. Through a series of additional acquisitions, Diamond Crystal® brand grew into a broad portfolio of products. By the time it was owned by Akzo Nobel Salt (1987-1997), the brand offered not only culinary salts, but also salts used for manufacturing, agriculture, water softening and ice control. 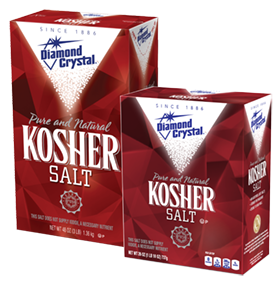 Diamond Crystal® Salt Sense® brand became the first real salt to offer 33% less sodium by volume, with 100% real salt flavor. Diamond Crystal® brand salt is now part of the Cargill family of products. As well as being the nation's largest marketer of salt, Cargill is also one of the leading agri - businesses in the world. Today, Cargill makes Diamond Crystal® products in states from coast to coast-- from Florida to Michigan, from New York to California. Cargill even harvests salt from offshore locations like Bonaire and Venezuela. Recent innovations include grinder salts, pool salt and our patented, easy-2-handle® double handled bag, featured on several Diamond Crystal® water salt products. Cargill adds a new salt production facility in Hersey, Michigan, expanding our capacity and providing customers with a variety of water softener and agricultural products. Cargill’s Diamond Crystal® brand is redesigned to align our product offerings across different segments.